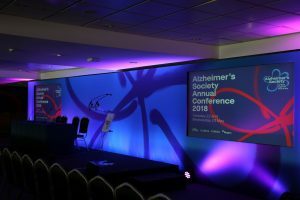 LTN Productions were proud to deliver the Alzheimers Society annual conference for 2018. The event was held at the Kia Oval in London and was attended by senior representatives from the Alzheimers society along with their patrons and sponsors. The brief was to provide sound, lighting and projection as well as relay screens for the main auditorium. We also provided audio visual equipment to several of the break-out rooms at the venue for specialist guest presenters to use with smaller audiences. Our set provided a branded backdrop with two rear projection screens allowing clear and crisp display of the presentation materials.